configure: error: Cannot find imap library (libc-client.a). Please check your c-client installation. The last switch (--enable-fpm) makes sure this PHP version will work with PHP-FPM. 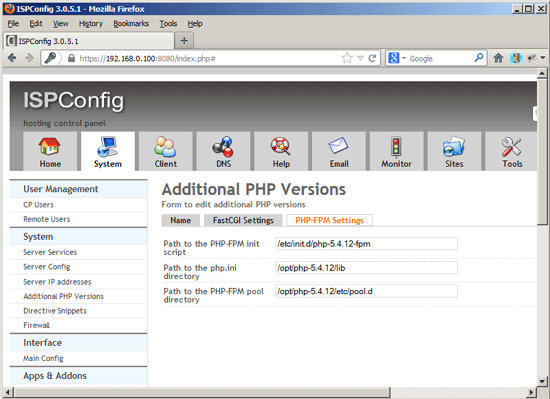 Starting php-fpm [04-Mar-2013 16:03:35] WARNING: Nothing matches the include pattern '/opt/php-5.4.12/etc/pool.d/*.conf' from /opt/php-5.4.12/etc/php-fpm.conf at line 512. That's it - if you like, you can now install some additional modules like APC, memcache, memcached, and ioncube. Next download and unpack the correct ionCube Loader package for your architecture (x86_64 or x86). ISPconfig 3 zweite PHP Version wird nicht übernommen, intern keine -zuweisung zur Domain erfolgt. Bei Prüfung wird stets die Standard php-5.4 Version gefunden, sollte aber php-5.3.28 sein. Warum übernimmt ISPconfig 3 nicht diese -zuweisung.